Dubbed “the lady with the naughty eyes”, American comedienne Edith Clifford toured Australia in late 1927 with her piano accompanist Carl Kellard. Performances were given at the Sydney and Melbourne Tivoli theatres, as well as the Geelong Theatre. A reporter from the Evening News reported on her appearance at the Sydney Tivoli in glowing terms. “When Edith Clifford, the new Tivoli star, walked on to the stage last night, she brought with her the answer to the query: “Why do men prefer blondes?” Glossy light golden hair, a sweet face, artistic dresses, subdued tinted lights in a carefully-studied stage setting, a charming personality and a stock of cleverly interpreted songs were the main secrets of her instantaneous success.” ‘CHARMING BLONDE’. Evening News (Sydney, NSW), 12 August 1927, p. 15. The Columbia Graphophone Company in Sydney seems to have caught wind of Clifford’s local success at the box office. On Wednesday August 17, 1927, she recorded 5 titles at Columbia’s Sydney studio on Parramatta Road in the suburb of Homebush. Curiously, the Evening News reported a day prior on Tuesday August 16th that she performed five songs on her Monday night bill at the Tivoli. This first recording session could very well be her set-list for the preceding show, or at least indicative of the titles she performed, although there is nothing in the papers to confirm this. 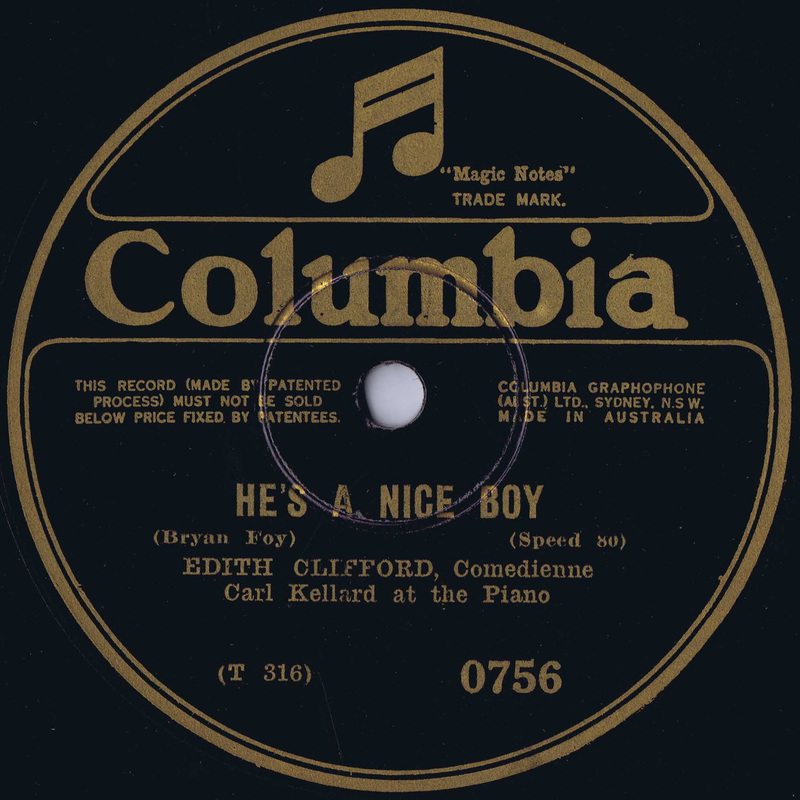 It was in her second session for Columbia on August 27 that a curious number titled “He’s a nice boy” slipped into the recorded repertoire.∗ The composition is credited to Bryan Foy (1896-1977) a motion picture director, producer, songwriter and vaudevillian from Chicago who is known for making low-budget Hollywood ‘B-movies’. And it is to Foy to whom we can blame for the homophobic portrayal of the “nice boy” presented in the lyrics. It is difficult to tell what the motivations and sources were for penning these lyrics, or the context in which it was performed, simply because the song is so obscure. Perhaps a sheet music cover of this song would provide a portrayal of the “nice boy” and all the effeminately “gay” stereotypes covered in the lyrics, but no trace of a commercially published music sheet has been found. It is also hard to guess what involvement Clifford herself had in composing this number, and how she delivered it in the context of her shows. The Sun mentioned on August 21 that Clifford collaborated with her “song-suppliers” in music and verse. Hopefully more salient information will come to light to explain and extrapolate on this strange homophobic ditty. Neat and slender, sweet and tender, oh so goody good. And near beer just knocks him off his feet. He’s such a nice boy, you should see him crochet. When he walks down the avenue the fellows tip their hats. He never did a wrong in all his life. He told me that he still believed in Santa Claus. And he’d make a wonderful wife. He’s such a nice boy, he’s never been kissed. He goes to bed at night at half past nine. He rushed by the smoker and he sat with all the men. But I’m glad he’s no relation of mine! Captured at the stock standard 78rpm. The suggested playing speeds on Australian Columbia labels during this early period (1926-1928), whether 80rpm or 78rpm, are unreliable. Edith Clifford (vocalist : soprano vocal). (2017). In Discography of American Historical Recordings. Retrieved December 5, 2017, from https://adp.library.ucsb.edu/index.php/talent/detail/3926/Clifford_Edith_vocalist_soprano_vocal. Laird, Ross, A Discography of popular music recorded in Australia or by Australians overseas, 1924-1950, 5th (Revised) edition, Canberra, Discographic Researchers, 1997. Why Do They Call Them Flappers? – Edith Clifford on Columbia 1513-D courtesy of the Internet Archive. * It is important to note that five out of eight titles that Clifford recorded in Sydney were re-recordings of those that she had made for Columbia in New York during 1926 and 1927. The remaining three compositions, including “He’s a nice boy” were not previously recorded, according to the available discographic information.